MaryAnn here and today I get to take over the Kat Scrappiness Design Team Blog as a Guest Designer. 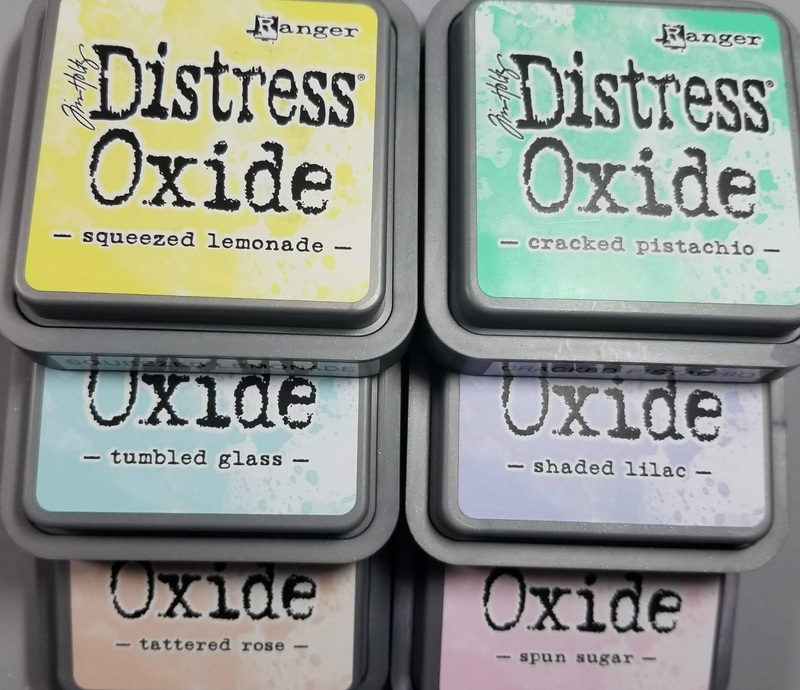 I have been a long time customer of all things Kat Scrappiness as her fast shipping and great prices keep me coming back. This makes another project for the month of April for me. I will be posting a few different projects this month using her exclusive product along with products you can easily shop for on her website. 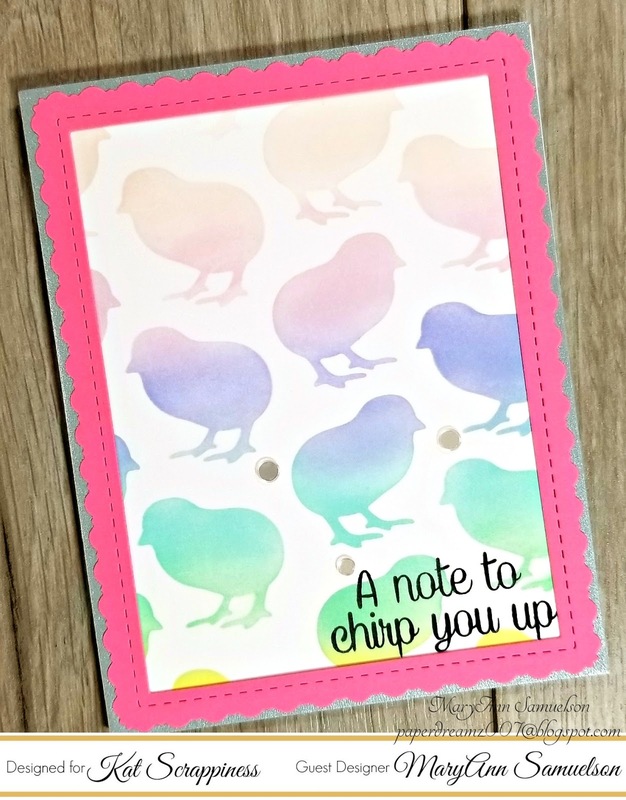 Today’s card use’s the new Crafters Essentials Easter Edition Dies along with a few other Dies from her exclusive line. I will be sure to add links to the items in the card recipe below. On an A2 sized side fold card base of Neenah 110lb Classic Crest Cardstock I placed a strip of post it tape along the score line just to the backside of the card. I like doing this because it gives the edge a nice finished look when the card is folded. Tape down your homemade stencil. I used yellow painters tape because it is low tack yet still holds everything in place. 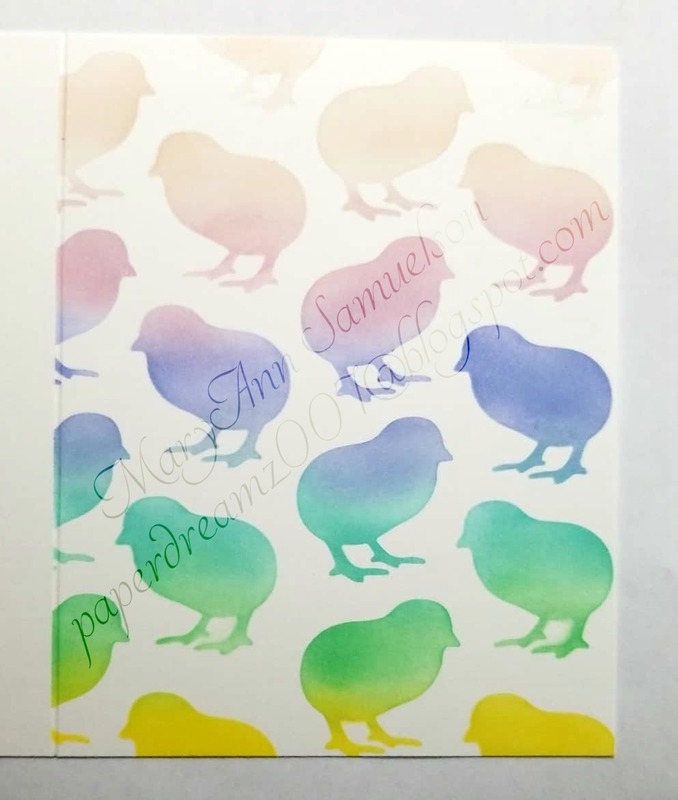 For my blending I used some makeup brushes that are all the rage right now to blend my Distress Oxide inks in a rainbow pattern on the card base. 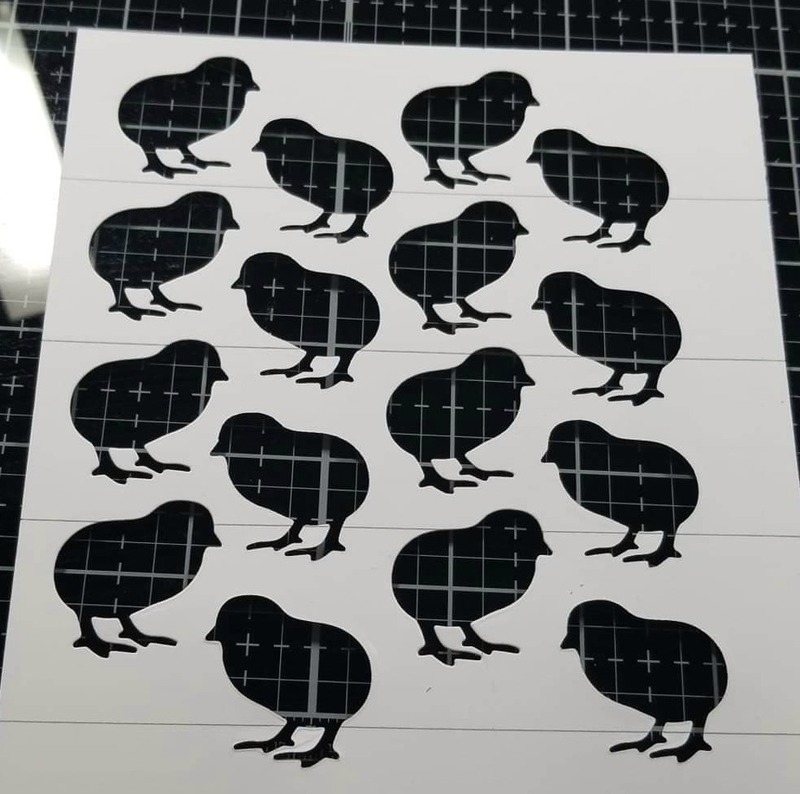 TIP: you cannot be overly vigorous doing this because the stencil is made from cardstock and the tiny spots where the chicks feet are will bend. While the blending looked great it still seemed rather blah to me overall so I cut a piece of silver shimmer cardstock to A2 size and then die cut a rectangle from the center of it to create a frame around the card front. Again I was faced with still not enough “POP” in my eyes on the look. So I grabbed a piece of Gina K Designs Passionate Pink paper and I used the Stitched Fancy Scalloped Rectangle Die to create another frame which I die cut a rectangle from the center of. Nuvo Deluxe Adhesive was used to attach the silver shimmer frame and the Passionate Pink frame on top of the card front. Lastly I added a couple of Confetti Sequins.